"You know, we could make that," Mark said after bringing me home sushi as a treat for the fifth time in a row. And he was right. I'll let you search the internet for assembly instructions. It's all about temperature of the rice, a piece of saran wrap for rolling (wasteful, I know! ), and keeping the filling very small. You'll notice I didn't take any pictures of the cut rolls, though. I'm still figuring out how to slice my masterpiece without knocking it out of shape. Maybe some sushi experts out there will comment with their tips? Hi - just want to mention that you can use a sushi bamboo roller mat instead of saran to roll sushi. They are only a few dollars, and work great (plus no waste)! We got ours from a local Asian store. I also got into sushi a few years ago, you can add any ingredients you want. i like sweet potatoes or carrots and cucumbers. Get a bamboo sushi mat, it makes rolling them much easier. Hi Anna, Love your blog, have learned a lot from you guys. For once you have ventured into some territory that I feel I can impart some wisdom. To answer your question, the (not so) secret to slicing a sushi roll is the right knife. The style of knife you want is called a Yanagiba. The long thin blade allows you to draw the knife through what you are cutting without applying hardly any pressure as long as you keep it sharp. There is a range of price options for these on Amazon, and I am sure that, as with most knives, you get what you pay for. If you are going to be making sushi on a regular basis, a good knife is a solid investment. This style of blade also does a great job of slicing any large cut of mean very thinly, I have used it to slice roast beef and turkey into deli meat. 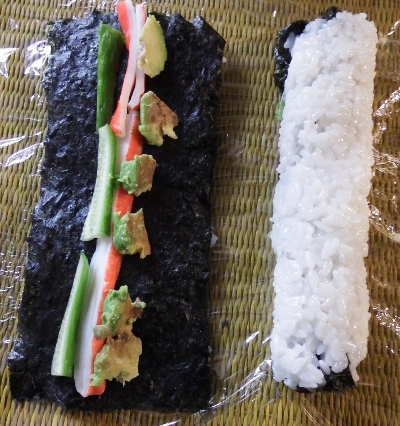 A couple of suggestions based on my experience, your rolls will come out more even if you focus on getting a uniform but thin layer of rice spread on your nori (seaweed). I try for a single grain of rice thick layer, and then you don't have to break the sheet in half, just roll it back over on itself, this helps it stick together. Position your filling about one inch up on the end closest to you and then roll away from you, pulling up on the plastic wrap with every turn to keep it from ending up on the inside of your roll (like I did the first time I tried this). Don't be shy with applying pressure with every turn using your bamboo mat to get things tight, working from the center of the roll out to the ends, if some of your filling squirts out the ends that is ok, it will ensure that you have an even core inside the roll. On a personal preference note, try using real crab meat instead of the imitation stuff, snow crab legs (which are reasonably priced frozen at Sam's club) are a good choice. If you decide to stick with the fake crab, whatever you do, don't Google the ingredients and manufacture process. Ganbatte (good luck) with your sushi! I've only made sushi a few times, but found that a silicone baking mat worked just fine in place of saran wrap. To not ruin the role, I use a wet sharp knife. Good luck. A super sharp knife. you don't want to saw it like a branch. if you have the roll facing so the edge of the nori is pointing the same way that you draw the knife it can help. same with lightly dampening the sides of the knife with water so the rice dosen't stick. little things can help but i'v eaten many of the sushi rolls i've made from bowls. 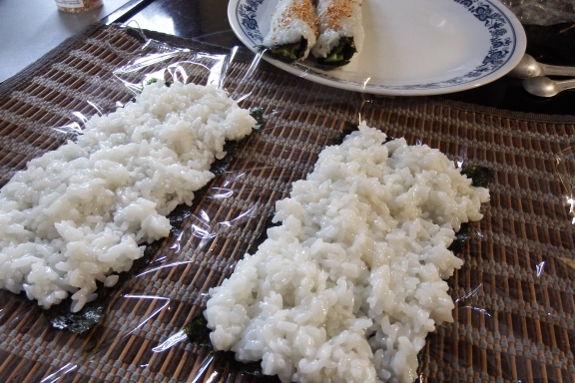 Okay, I have to ask...why is the rice on the outside of the nori sheet? Is it because it's a "California roll"? I'm just really curious. Normally, the nori is supposed to be the outside casing.